Cake 8: Tiramisù - Do You Know The Muffin Man? At fifteen minutes past the start of class, my partner was still absent, so I had to go solo on Saturday. We made tiramisù, a popular Italian dessert, and did everything from scratch. First up: ladyfingers, or, savoiardi. These are light, delicate cookies that can often be found in well-stocked supermarkets. Even Chef said she would probably not go to the trouble of making these at home. I ran over to the other classroom and started whipping some egg whites. Back in the main room, I whisked egg yolks with sugar and sifted flour and cornstarch together. I kept an eye on the progress of everyone else because I didn't want to be the last one to finish. My whites weren't quite at the firm peak stage but others had started to pipe their batter out, so I took the bowl off the mixer and folded the yolks in gently, followed by the flour. We piped the mixture into four discs the size of our cake rings, as well as into ladyfingers. Chef suggested we pipe them close enough so that they were touching, kind of like a fence. Making individual ladyfingers might be more traditional, but it's much more difficult to assemble the cake. After dredging the tops with sugar, into the oven they went. Unfortunately, Chef overbaked some of the trays. Mine came out just right, but quite soft. The first step was to whip some heavy cream into soft peaks. After I set that aside, and quickly washed the whip and bowl, I stirred the mascarpone until it was softened. Then, I whisked egg yolks and sugar over a water bath until it was hot to the touch. This step is not part of a traditional recipe (which uses raw yolks) but it gives everyone peace of mind to know that any bacteria would be eliminated. I put a bowl of water, brandy and gelatin over the water bath to dissolve. In the meantime, I folded together the whipped cream, mascarpone and egg yolk mixture. The last step was to whip up egg whites with some sugar. Finally, the gelatin mixture was folded into the mascarpone, and the egg whites were incorporated. Traditionally, gelatin and whipped egg whites are not used, but Chef said that our cake slices would hold up better with gelatin, and the whites would add a bit of lightness. For assembly, we trimmed the ladyfinger discs to fit the bottom of the ring. We trimmed one side of our ladyfinger “fence” and placed it (sugar side facing outwards) around the ring. A brush of espresso syrup (simple syrup with brewed espresso or instant espresso powder) added flavour and contrast to cut the richness. The mascarpone mixture was poured to fill half the ring. Then, the other disc, or alternatively, leftover ladyfinger trimmings, was put on top and brushed with syrup. A final layer of mascarpone completed the cake. After 20 minutes in the freezer, we completed the dessert by dusting the top with cocoa. This is quite tasty. 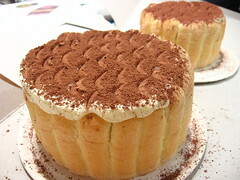 I've never made traditional tiramisù before so this was a good experience, especially since I made two all on my own!